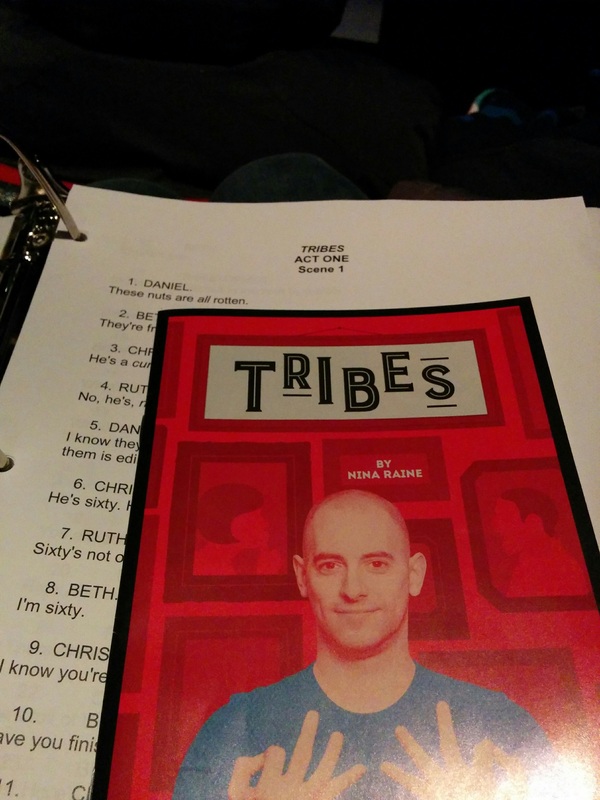 The newest buzz in the Montreal theatre scene is all about Tribes, an award-winning play by Nina Raine, now running at the Segal Centre. Tribes, directed by Sarna Lepine is about communication, miscommunication and being heard. It tells the story of Billy, a young boy who is the only Deaf person in his loud, crazy family of five. The play opens to what seems to be a typical family dinner in their household – a chaotic one. As every member of his family argues and yells over each other, Billy is left in his own world as he has no clue what is being said. We learn that even though he is Deaf, Billy’s family raised him as hearing. He does not know sign language, therefore, he speaks without hearing the sound of his voice and has no choice to try to miserably fit into the world that he can’t hear. Then he meets Sylvia (Andrea Runge) and falls in love with her. Sylvia is hearing, but she’s slowly going deaf. Both of her parents are Deaf, so she knows sign language. She teaches Billy to sign and invites him into the Deaf community. He then thinks he has found the world he should belong it, and tries to communicate that to his family. That’s what’s generating a lot of buzz about this play – insight into the Deaf community and the way they are perceived by those who don’t know much about it. I wanted to see Tribes as soon as I found out about it earlier this year, when Jack Volpe, who plays Billy, told me that he got cast in it. Jack is a Deaf actor and director who can relate to Billy as he grew up in a hearing family. I was one of the cast members of the last show he directed with Seeing Voices Montreal, a theatre company comprised of both Deaf and hearing cast and crew. You can read more about this here. But to my dismay, in the time lapse between my last curtain call, and the premiere of Tribes, I lost my hearing. I am now extremely hard of hearing, deafened, almost deaf, or whatever you want to call it. You can read about what happened here. So like those in the Deaf community, I have no choice but to stay away from theatres, movies, concerts, and almost everything that people my age do. The program and script. That’s Jack Volpe on the cover. The Segal Centre did something theatres rarely do- they made the show accessible to the Deaf community. I went to show during one of the three performance nights where they had ASL interpreters available to those who needed it. Of course, I don’t know ASL, so it wasn’t useful to me. Instead, the production crew was nice enough to provide me with the script so I could read and follow. Thank you, Segal Centre! Even with a script, the beginning was hard to follow. All the characters were in the opening scene, bickering at each other in a fast-paced family dinner scene. By the time I read the end of page one of the script, they were already at page four. I had to watch and listen for a few minutes before I could distinguish the pace, and get an idea of each character’s voices which I could hear. For the whole two hours, I was the only one bobbing my head up and down, glacing at the script and the play at the same time, quickly flipping through the pages, and using a phone flashlight to see better (ah, technology!) and hoping it wouldn’t bother anyone. Tribes is not necessarily the most educational piece for those who truly want to learn about Deaf culture, but it provides humourous replications of the miscommunications that may happen between the deaf and hearing worlds. Tribes runs at the Segal Centre until December 30. One last ASL-interpreted performance is set for Sunday, December 13. Reduced-priced tickets are available for all audiences here.